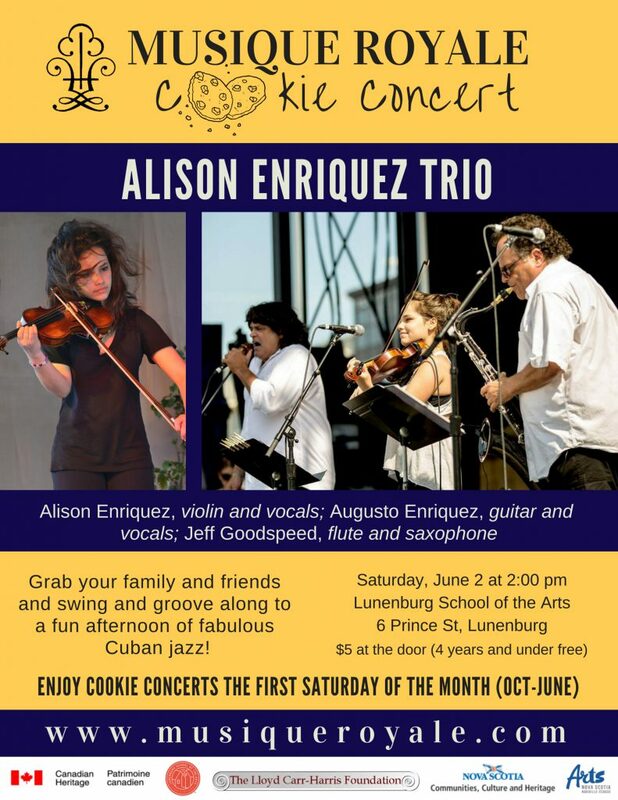 Musique Royale’s Cookie Concerts run each year from October to June so our next event on Saturday, June 2 at 2 pm at the Lunenburg School of the Arts will be our final one before the summer. We’re so pleased to feature Alison Enriquez (violin and vocals), Augusto Enriquez (guitar and vocals) and Jeff Goodspeed (flute and saxophone) at this event. You won’t want to miss this one if you are in Lunenburg that day. Admission is $5 at the door (4 and under – no charge), and a cookie treat at the end. Multi-talented Alison Enriquez is a grade 11 high school student at Armbrae Academy in Halifax. She is currently Principal second violin with the Nova Scotia Youth Orchestra, Assistant Principal second violin of the Dalhousie Orchestra, and Concertmaster of the Maritimes Orchestra. She also performs (violin and vocals) with Jeff Goodspeed’s jazz quartet every Sunday at Stayner’s Wharf between 5 and 9 pm. Alison will be participating in the 2018 Scotia Festival of Music in May. A Cuban superstar, Augusto Enriquez gave up a medical career to pursue music. A classical tenor, he has shared the stage with Sting, Andrea Bocelli, James Brown, Lou Reed, Rod Steward, Tina Turner, Ray Charles and others. In 2004 he was invited by Luciano Pavarotti to participate in his concert television show, “Pavarotti and Friends,” and in 2013 was awarded the highest honour from the Cuban Ministry of Culture. Saxophonist, flutist, educator and dedicated supporter of young talent, Jeff Goodspeed is Lead Faculty of the Music Arts Program at Nova Scotia Community College. He and his wife, Amara, founded the Los Primos Project in 1997 as a cultural exchange between music students and professionals in Cuba and Nova Scotia. A freelance musician for 35 years, his quartet has been playing jazz every Sunday at Stayner’s Wharf, clocking up over 700 performances to date. Jeff has shared the stage with Frank Sinatra, Natalie Cole, David Foster, Aretha Franklin, Bob Hope, Lisa Minnelli, Mel Torme, Shirley MacLean, Liberace and others. His recordings won ECMAs in 1996 and 2004. Musique Royale gratefully acknowledges the Federal Department of Canadian Heritage, the Nova Scotia Department of Communities, Culture and Heritage, Arts Nova Scotia, Peggy Corkum – major season benefactor, the Lloyd Carr Harris Foundation, The Craig Foundation, anonymous contributors, corporate and individual sponsors, committed volunteers and all patrons for their kind and generous support of Musique Royale.